产品动态 – Product News – Listen, Inc. Listen is excited to announce the release of SoundCheck 14.1 for Mac. Offering similar functionality* to the Windows version of SoundCheck 14, this is the first large-scale commercial audio test software to run natively on a Mac. SoundCheck is a powerful software package which controls and communicates with your audio measurement hardware and contains all the stimuli, algorithms and functionality to develop and run complete audio tests on loudspeakers, headphones, microphones, smartphones, tablets, hearing aids and more. SoundCheck 14.1 for Mac offers seamless integration with Listen’s expanding line of hardware products including AmpConnect, DC Connect, SoundConnect 2 and AudioConnect, making the initial system setup quick and easy, even for novice users and non-technical personnel. All Listen hardware products, as well as the Portland Tool & Die BTC-4148 Bluetooth interface can now be directly controlled from within the software, enabling them to be changed as part of a sequence. Users of previous PC-based versions of SoundCheck can upgrade these to the Mac version for an additional fee. Contact sales@listeninc.com for more information. * Note that there are some minor differences between the Mac version and the Windows version due to variations in the development environment, particularly surrounding data export functionality. Please contact your sales engineer for more information. 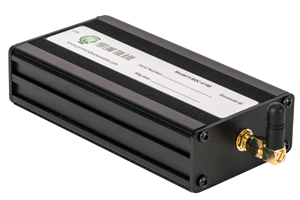 The unit is rugged and compact, measuring just 30 x 64 x 136mm. With only one connector – a USB for connection to the computer for power and control – it is simple to use and offers minimal potential for incorrect operation. It can be controlled via the USB virtual com port using a command line utility, or from within SoundCheck using the control utility via a system step for simple integration with your test sequences. Although it is less full-featured than its R&D counterpart, the BTC-4148, it is approximately half the cost. The New BTC-4148 enables Bluetooth devices to be accurately tested in SoundCheck® by offering full control over the Bluetooth connection. Accurately measuring Bluetooth devices is challenging. The Bluetooth protocol is a dynamic and adaptive system that provides devices with many options and parameters that are normally negotiated and set in an invisible manner. Using typical PC Bluetooth interface devices as an audio bridge in test applications is not ideal as the compression codec, sample rate etc. cannot be controlled and the engineer is left guessing as to what values are actually used. The BTC4148 overcomes this by offering full control over all Bluetooth protocol settings and explicit control over all the CODEC, sample rate transmitter power etc. This enables devices to be specifically tested under the conditions that they need to operate. A revised version of our sequence for Max SPL of headphones to EN-50332 is now available. This incorporates all the changes made in the 2013 revision of the standard. This includes a new sequence for testing Bluetooth and USB headphones to meet the standard’s additional stipulations for testing digital devices. SoundCheck ONE, our budget SoundCheck system has been updated and expanded for its release with SoundCheck 13. SoundCheck ONE is essentially a lower cost, simplified, version of SoundCheck coupled with the AmpConnect ISC hardware. SoundCheck ONE offers the capability to test loudspeakers, microphones and headphones within predetermined sequence templates. Although the user interface is the same as in the full version of SoundCheck, rather than using the Sequence Editor, SoundCheck ONE users are supplied with sequence templates. These templates serve as the starting point for all SoundCheck ONE tests and can be used to generate as many product-specific sequences as desired by selecting parameters such as the stimulus signal, characteristics to be measured, frequency range, level and limits. SoundCheck ONE is designed for customers who do not own a full version of SoundCheck and need a low cost and easy to set up system for basic production line tests of loudspeakers, microphones or headphones. While it offers the same accuracy, advanced algorithms and speed as the regular version of SoundCheck, its flexibility and test customization capabilities are restricted. It is a good entry point for a company testing their products for the first time or moving up from a more rudimentary test system as it can be upgraded to the full version at any time for an additional fee. We are excited to announce a complete system for testing of smartphones, tablets, and Bluetooth speakers on the production line. Soundcheck, combined with the new GRAS production line acoustic test chamber offers the acoustic isolation needed for these tests combined with the speed, flexibility and performance of SoundCheck. The test chamber is robust and user friendly, and is designed to offer fast, accurate and repeatable results in automated production environments. 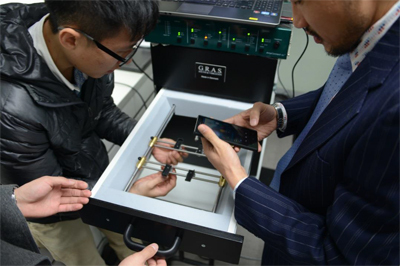 It is very flexible – easy fixture adjustment to accommodate a variety of different devices and positions, and ensures that the test chamber can be re-used for different projects. Naturally it will integrate seamlessly with SoundCheck.